Hazare's agitation entered day 6 on Monday. 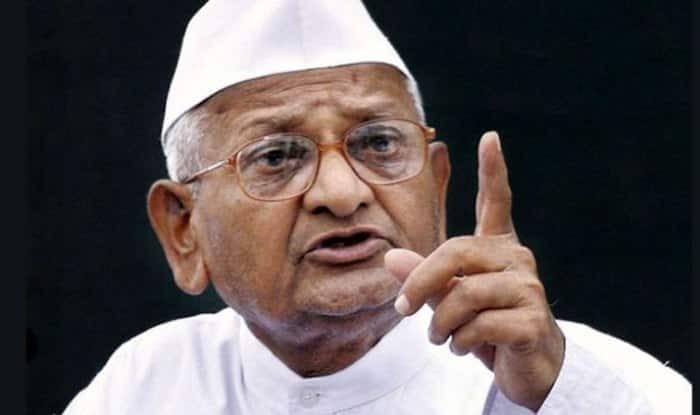 Hazare has been on a hunger strike since last Wednesday at his native Ralegan Siddhi village in Maharashtra’s Ahmednagar, demanding appointments of Lokpal and Lokayuktas and resolution of farmers’ issue. “(The) Modi government has breached the faith of people. If this government does not fulfil its promises made to the country in the next few days, I will return my Padma Bhushan,” he told PTI. He was awarded the third-highest civilian honour of the country in 1992. Hazare’s demands include an immediate appointment of Lokpal at the Centre and Lokayuktas in states and implementation of Swaminathan Commission’s recommendations for tackling agrarian distress and electoral reforms. On Sunday morning, a group of farmers and youths blocked the Ahmednagar-Pune highway at Supa village in Parner tehsil. As many as 110 protesters were detained in the afternoon and released after the traffic resumed. Dr Dhananjay Pote, who is monitoring Hazare, said he had lost 3.8 kg in the past five days and his blood pressure, blood sugar and creatinine level in the urine had gone up. Around 5,000 farmers from the district are likely to stage a protest outside the Ahmednagar collector’s office to support Hazare’s agitation, his associates said. Narayan in the 1970s when the socialist leader took on the then Indira Gandhi government. Hazare had earlier declined to meet state government envoy and minister Girish Mahajan for talks. Hazare had said that he welcomed the Maharashtra Cabinet’s decision to bring the office of the Chief Minister under the ambit of the Lokayukta. “The strike will continue till the government fulfils promises they made before coming to power,” he said.